Beautiful sunset in April at Medano Creek. Every spring, usually in early to mid April, I make a pilgrimage to my favorite National Park to catch the return of Medano Creek. 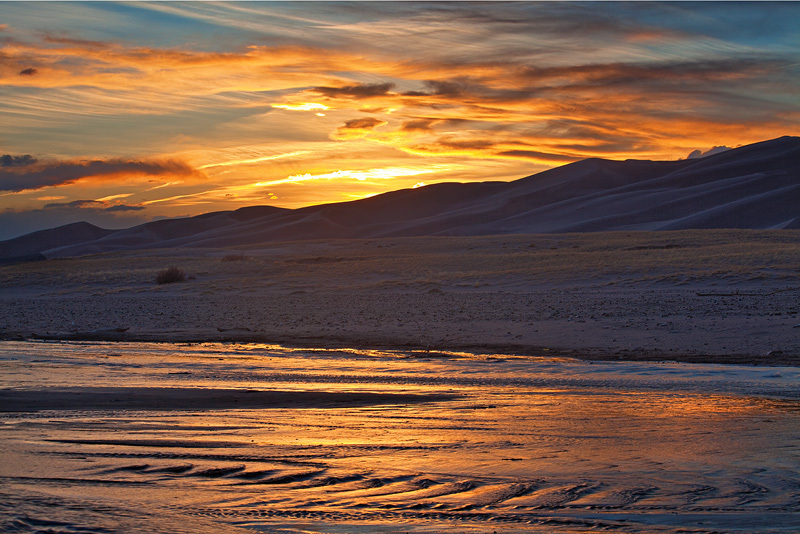 The creek is a shallow (usually only inches) stream that flows down the east side of the Great Sand Dunes each spring, fed by the melting snows of the Sangre De Cristo Range. The creek usually only flows for a few months; often it dries out by late summer unless there are some heavy monsoonal rains. The past few years it has been choked by black ash and tar from a big forest fire a few years back–but this year it is looking relatively clean. I spent a few hours in the afternoon just watching the complex wave and flow patterns in the creek, and taking some abstract photos. 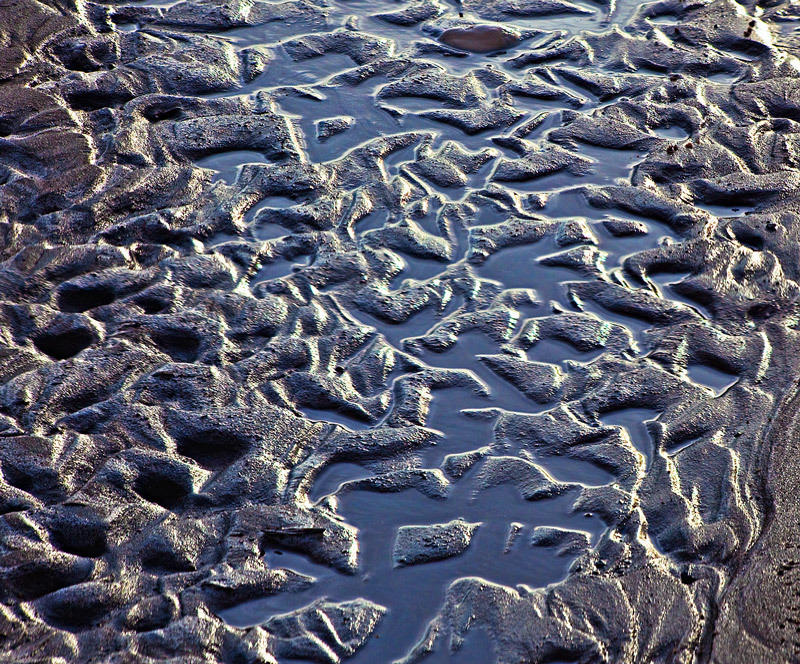 Abstract patterns in Medano Creek. 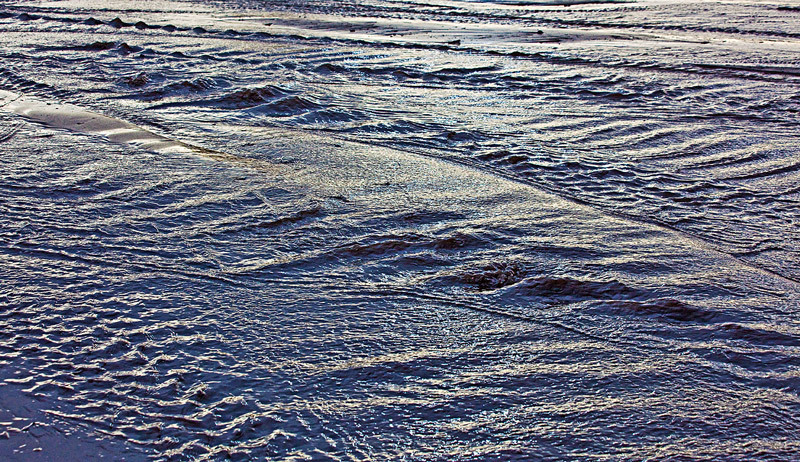 Then, a couple hours before sunset, I hiked to the creek’s end, where it disappears into the sand. I scouted for a good sunset composition, and took shots of the creek and snow-capped Mount Herard in the distance. A lenticular cloud above Herard was particularly attractive. Sunset was brief, with only local flashes of color, so I used a telephoto lens to focus on the small section of brilliant color in the sky and creek reflections. Another spectacular return of beloved Medano Creek! May it flow swift and deep this year.